The Play Order Editor window gives you plenty of control over your alternative song arrangements. 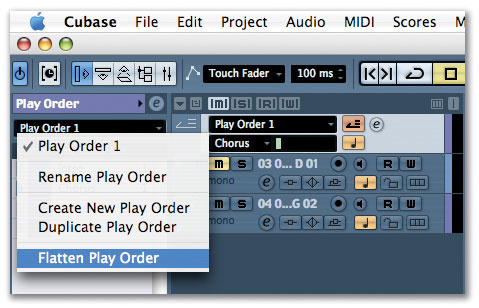 Cubase 's Play Order Track is a powerful, but often overlooked, facility that is a Godsend for songwriters, composers and remixers alike. Until the arrival of Cubase SX3 a couple of years ago, I'd long been frustrated by the songwriting process in Cubase. In fact, the same frustration applied to all the major sequencers that adopted the now-ubiquitous graphical arrange page model, with a timeline running left to right. Though the arrange page model offers some obvious benefits, and is fairly intuitive to those who learned to ply their trade on reel-to-reel tape and splicing blocks, it omits some of the excellent functionality that evolved in the earlier days of electronic and computer music: functionality that, until recently, was terribly missed! Anyone who has ever used Reason, or one of the myriad groovebox emulations, will be familiar with pattern-based sequencing. But these all attempt to recreate hardware sequencers, along with many of their inherent limitations. While eight-, 16- or 32-step sequences can be great for constructing loops and grooves, they can be pretty limiting for full-scale remixing and songwriting. It wasn't always this way. Way back in the year dot, when I started computer recording (for MIDI — audio at that time was limited to bounces on my four-track Tascam Porta 05), my sequencer of choice was Prism by Magnetic Music, who seem to have long since disappeared from the music-tech radar. Like Notator, Vision, and several other of the early MIDI sequencers, it was pattern-based. There was no timeline, no timeline-based looping of selections, and no arrange page. In fact, the approach was more akin to a relational database than a modern computer sequencer. You programmed your various parts, comprising your rhythms, chords and melodies, then programmed the order and number of repetitions of each of these parts to form your song. There was some flexibility: for each play of each section, you could mute, solo or transpose different tracks. The reasons for moving to a timeline-based approach when technology allowed are obvious, but it was a surprise to see the pattern-based functionality all but disappear with this move. Logic allowed some flexibility with its folder tracks, but none of these solutions was anything like as elegant as the earlier attempts. Cubase VST allowed you to experiment with different Arrangements of your song within the same project, but to the user, these effectively appeared to be separate songs, and this option disappeared with the introduction of Cubase SX1. 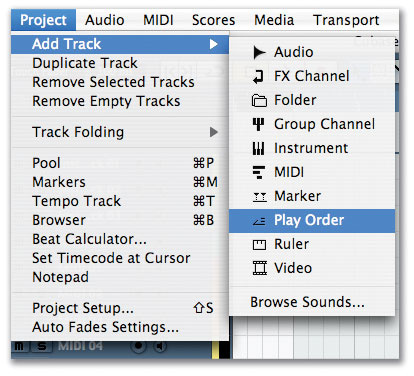 To add a Play Order Track to your project, simply select Project / Add Track / Play Order Track.OK, enough reminiscing and lamenting: the Cubase Play Order Track, introduced in Cubase SX3 (and retained in Cubase 4) righted the wrongs. It is an elegant reintroduction of the pattern-based concept, but this time, running within the modern timeline-based sequencer. Although there are still a few features I wish Steinberg had had the sense to include or improve (see the 'Wouldn't It Be Nice' box) it is nonetheless the best such solution I'm aware of, by quite a distance. Let's start with the basics: how do you use the Play Order Track, and to what uses can you put it? Before you start, it is worth saving your project under a new name. There's no destructive editing of audio files involved in using the Play Order Track, but it is easy to hit Save and overwrite your project, so this is a worthwhile safeguard. Next you need to add a Play Order Track: to do this, go to Project / Add Track / Play Order Track. The empty Play Order Track should show beneath the currently selected track. When you select the new Play Order Track, the Track Inspector displays its various options allowing you to determine the order and repeats of the parts you create. Alternatively, if you prefer a floating window, you can click on the track's 'e' icon to access the same functions in the Play Order Editor. We'll come back to the editing shortly, but you'll first need to create the parts that you are going to sequence. Creating these parts is easy, but it is easier still if you have the Play Order Track positioned next to the timeline, so I find it is best either to drag the Play Order Track to the top, or create a ruler track above or below the Play Order Track. When you've decided on the sections of your song that you want to create parts from (I suggest keeping things simple to start with, and limiting yourself to a few parts), you draw a part onto the Play Order Track using the pencil tool. This is rather like drawing multiple loops on the timeline and, as with the timeline, you may want to make sure that the pencil is snapping to the bar, beat or grid before you do this. Parts are drawn into the Play Order Track using the pencil tool, just as you can with any other parts on other tracks. By default, the new parts in the track will be labelled A, B, C and so on. You'll also see them appear in the Inspector or the Play Order Editor. It's a good idea to rename the parts, as the A, B and C labels otherwise quickly become about as helpful as air-con in the Arctic. I didn't find this an intuitive process: the usual click, wait and click again to select the text for editing doesn't work, and double-clicking does something else, as we'll see later. In fact, you have to hold down the Alt or Option key and double-click (to be fair, it does mention that in the manual, but why the departure from convention, I don't know). Creating your arrangement is much more intuitive. If you double-click one of the parts, it will appear in a list in the left half of the Play Order Editor or the top part of the Inspector. Click it again and you'll see the number next to it go up incrementally: this determines how many times this loop will play. Alternatively, you can type the amount of repeats into the box. If you want to add additional parts to the arrangement, you can either keep double-clicking (which is why this doesn't work for renaming the part) or you can drag and drop the part into the list at the desired position. Sequencing the patterns really couldn't be simpler. The bright orange icon switches Play Order mode on and off. When it is greyed out, Cubase remains in its default mode.To hear the effect your new Play Order has on the arrangement, you need to activate Play Order mode by clicking on the button, either in the Play Order Track itself, in the Editor, or on the Transport Bar. When this mode is activated, you'll notice the project cursor running in the cycles you have programmed in the Play Order Editor, rather than along the timeline as is usual. There are also basic transport tools which allow you to skip to the next part and so on. Although you can only have one Play Order Track, you can create multiple Play Orders within it, either by creating a new one, or by duplicating the current one as a starting point. This facility should appeal to anyone who used to use multiple Arrangements in Cubase VST, as this effectively means you can have multiple arrangements within one project. Steinberg have announced via their www.cubase.net forum that they will not, after all, be issuing the long-awaited 3.1.2 update for Cubase SX3. The announcement comes despite several reported bugs remaining unfixed in the program, and it has not surprisingly been ill received by many users. Steinberg had previously promised this final update to resolve the bugs, but have now admitted that they underestimated the effort it would take to adapt Cubase 4 to run on 64-bit systems. As a result, they have decided to divert the SX3 development resources to meet that requirement. While it is not uncommon for software developers to retire older products and focus on development of newer products, it is nonetheless common practice to issue a final fix to ensure that the product is fully functional. Let's hope the sacrifice is worth it! 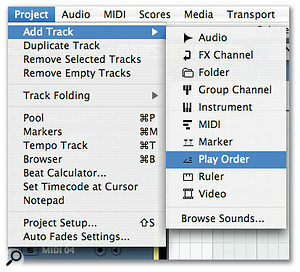 By clicking on the Play Order Track name, you get a drop-down menu that offers the option to 'flatten' your Play Order, which effectively creates a traditional linear Cubase arrangement based on your Play Order.When you're happy with the arrangement, you are able to flatten the Play Order to create a standard, linear version in the Arrange page, as you would normally have in Cubase (you just select 'Flatten Play Order' from the drop-down menu as shown on the next page). But beware! Although this process isn't destructive to your audio files, it can be destructive to your arrangement, as flattening the Play Order will remove any sections that are not in the Play Order (including any alternative Play Orders you might have created). Though it's reversible via Undo, it is a good idea to back up the project before flattening and, if you want to keep it, to save it as a new version after flattening. Recording is possible in Play Order mode, but isn't fully integrated with the idea. While the cursor will happily skip from one part to the next on playback, any audio files that you record are recorded as single files and appear as continuous parts in the timeline in the usual way. In other words, the audio you record doesn't line up on screen with what is in the Play Order. I suppose this makes sense, given that you would otherwise have to record audio over itself where you repeated parts, but if Steinberg are reading this, they should note that there is potential here for a very powerful addition to the Play Order facility. OK, so we have pattern-based sequencing in a modern MIDI + Audio sequencer, and a great tool it is, but what can it do for the creative process? There are some obvious uses, not least creating multiple arrangements as mentioned above, or creating and sequencing parts to create a basic remix. But there are a number of alternative uses that work well. It is great as an initial sketchpad while you are writing or composing: while you'll probably want to add more variety later on, you can get the basic structure of intro, verse, chorus and so on, and then flatten it to give you the basic track to work on. For the same reason, it can make a great time-saving tool if you are working with a band in the studio, as you can rearrange guide tracks on the fly and still record along in linear fashion in the project. You can also use it for loop creation — for remixing short drum parts, for example — though, for some reason I can't discern, you can only draw Play Order parts as small as an eighth of a bar, so the options here are a little limited. Alternatively, extending the guide-track idea, it is easy to create a drum guide track and then jam along to the rhythm, using your keyboard or drum pads to humanise the rhythm, and adding fills along the way. This works particularly well if you have a sample library with individual hits as well as loops, as you get both the sound you're after and the feel, but you can create your own variations on the loop; I suppose there's nothing to stop you doing this anyway, but I find it much easier using the Play Order Track, rather than copying and pasting or repeating loops that I'd later need to delete. If you've ever found yourself needing to insert bars for an additional section in the midst of a complex arrangement (as I have many times! ), it becomes much easier with the Play Order Track, particularly if you need to insert more than one such section. It also enables you to work in a different way with the timeline: I sometimes find it more convenient to work on loops as individual sections, separated by silence on the Arrange page, as I find this makes for ease of editing and navigation. With the the Play Order facility, working in this way is much improved. When you 'flatten' the Play Order Track, Cubase naturally cuts the audio as if you were cutting out a loop. Consequently, you get the same pops and clicks as you normally do when editing, so it is worth making sure that Cubase 's 'Snap to Zero Crossing' box (Cubase / Preferences / Editing / Audio) is ticked before flattening the Play Order. This will make the transitions as smooth as possible. 'Snap to Zero Crossing' can be useful to avoid nasty pops when you flatten your re-ordered track.You'll also probably find that there are Events that start before, or finish after, the edit points, and you'll need to go into the flattened track to do a little fine-tuning. For example, if you have any transitional sounds, such as sustained notes that overlap the end/start of different sections, or slow pads that climax after the edit point, the Play Order will chop them short. And if you have MIDI notes that are played slightly ahead of the bar, these will also disappear. Thankfully, the editing task isn't massive: it's just a case of going back in and dragging the Events to the size they need to be to allow these notes to sound properly. One risk with using the Play Order Track (as with any loop-based composition process) is the ease with which you can produce mind-numbingly repetitive music. So it is probably a good idea to think of the Play Order as one step in a longer process. It really is worth going into the flattened track and adding back in a bit more variety, particularly with things such as volume and panning automation, or filters on audio, and with timing and velocity on MIDI parts. This way you get a fantastic 16-bar loop instead of four of the same four bars, which will help to keep interest in your track! First, something that harks back to Prism and the other early pattern-based MIDI sequencers: the ability to edit the MIDI information for each instance of each part, or at least basic elements such as transposition, program changes, mutes and so on. It would also be helpful to have more recording options in Play Order mode. If you record audio in the Play Order mode, it records as a single continuous file. I'd like to see it able to create regions alongside the Play Order parts. There are good design reasons for doing the continuous recording, and such a change might be complicated to implement, but it should be possible: and this would potentially provide a very powerful facility. Flatten Play Order is destructive: it doesn't affect your audio files, but you do lose your old arrangement completely. While you can always click Undo, it would be nice to have the option of flitting between your different arrangements, rather like you could do in Cubase VST, even after things have been flattened. A 'retain full MIDI note length' function would be useful. This would avoid the need for some of the editing you need to do to tidy things up after flattening things. At present, MIDI notes that sustain beyond the end of the looped part are cut off at the transition, but you often want them to keep going until they reach their natural end. As Mark Wherry noted in his review of Cubase SX3 back in SOS November 2004, you can start to run into problems when working with video: when the project cursor is leaping all over the place it doesn't do wonders for synchronisation! It would be nice to see an elegant solution developed to address this.